Lou Anders is one of many friends I’ve first encountered on the Internet, connected by mutual friends in the real world. I already knew his splendid reputation as the Hugo- and Chesley-winning editorial director of Pyr Books. Even before that, I’d become a fan through his relaunch of Argosy magazine, and I loved Swords and Dark Magic, an anthology Lou edited with Jonathan Strahan. Lou and I met in the flesh at Gen Con, where we participated in the Writers’ Symposium. He invited me to a game set in the world of his recent middle-grade novel, Frostborn. Later that summer, Lou invited me as one of his two dates (he gets two because he’s an international man of mystery) to the Hugo Awards. In addition to being the editorial director at Pyr Books, Lou is a prolific writer and speaker. If you get the chance to hear him at a convention, don’t miss it. And if you don’t get to conventions, “meet” him online at any of the links following the interview. 1. What, apart from your Scandinavian ancestry, drew you to Norse mythology as the foundation for Norrøngard and Ymiria? I don’t know how much of my ancestry is truly Scandinavian. We’ve got German and English blood, and my father likes to think he’s got a healthy dose of Viking blood via some Scottish roots, but I don’t know that we are any more Scandinavian than anybody else with British ancestry. But that actually illustrates a point I’m getting to. Prior to Frostborn, I’d written several screenplays, teleplays, theatrical plays, a nonfiction book, hundreds of pieces of journalism, short stories, but only two prior manuscripts. And all of this was predominantly contemporary or science fiction. I’d never written a secondary world fantasy, and I was very daunted by the prospect. I decided therefore that I would stick close to the roots of Western fantasy and branch out from there only as my confidence and ability grew. So I went looking at Norse mythology as the underpinning of a lot of what came later. And I thought, in my ignorance, I could tell this nice, little story in this isolated, snow-bound land far from civilizations and worry about the wider world later. But, before I ever set down the first line of plot, I discovered that I couldn’t write until I really understood the setting and the history of that setting. So I started looking into the history of Scandinavia. Oh my god, those Vikings went everywhere! They sailed to the Mediterranean and they even fought with Native Americans. I saw a cartoon once where an astronaut arrives on the moon only to find a longboat. Ergo, I couldn’t construct a history of what my faux-Norse had done without asking questions of their neighbors, and their neighbor’s neighbors, and their neighbor’s neighbor’s neighbors and so one. The result is that I have a detailed, five thousand year history of Norrøngard, and seventy-five thousand words of notes on the just under 30 countries that comprise the continent of Katernia and its nearest neighbor. Now, I’m certainly not advocating everyone go that route. But I’ve found for me, story emerges from world building and the more I know, the more naturally it emerges, and paradoxically, the less info-dumping the actual story has. If I’m making something up on the spot, I feel the need to explain it all as I come up with it, but if I already know it, if I’ve internalized it and it’s “real”, then it just comes out naturally as the story unfolds in tiny bits. And the more I know about the world, the more ideas for stories suggest themselves to me. I can spend five minutes pouring over one of the maps and come up with another idea for a future novel every time. Also, to be clear, 99% of that seventy-five thousand words of background material never makes the book, but it’s the iceberg under the surface that supports and lends authenticity to the tip you see. Now if I’d realized what I was in for when I wanted to start with the basics and go Norse, I probably never would have had the nerve to try! But I am so glad I did. And the extent to which all of this paid off was made very clear to me as I wrote the revised draft of Frostborn in Norway! 2. You actually include the Thrones & Bones game and included the rules in the book. How much do they deviate from the Scandinavian game Hnefatafl. There’s no agreed upon set of rules for Hnefatafl. There isn’t even a standard size board. You can find 9×9, 11×11, 13×13. The rules that are out there are reconstructions based on readings of the sagas where Hnefatafl is mentioned as part of a tale. I looked at a half dozen rule reconstructions, but no one version was right for me. So I cherry picked various rules, making alterations so they would fit together, and then I added some new rules that served the needs of my book. I’m fortunate that two of my nephews are chess champions, so I let them play each other to test the game, and my son and I have played quite a bit too. I’m very happy with the results, which I think is a fun game in its own right, while being similar enough to work as an alternate world’s version of an ancient Viking game. Frostborn will have the rules in the back of the book and the Thrones and Bones website will have more on how to make and play your own set. 3. Your villains include some powerful archetypes like dragons and the undead. What famous figures influenced your depiction of them in Frostborn? Well, you can’t have say dragon without invoking memories of Smaug. And with apologies to Benedict Cumberbatch, who was indeed magnificent, it was Richard Boone’s marvelous voice in the 1977 animated movie, The Hobbit, that forever tattooed my young mind with what a dragon should be. Boone’s performance has been my benchmark for dragons ever since. In trying to reach that bar, I had to actually put Boone out of my head and search for another voice that could mesmerize me with as much force. So here’s a secret: I kept a picture of David Bowie open in Scrivener every time I had to write Orm, and I watched interviews of Bowie on YouTube as well. How’s that for a famous figure for you? As for Helltoppr, I don’t know that he has any one inspiration, so much as the idea of power and greed and regret, but if they ever made a Frostborn film, I’d be keeping my fingers crossed for Max von Sydow to voice him. 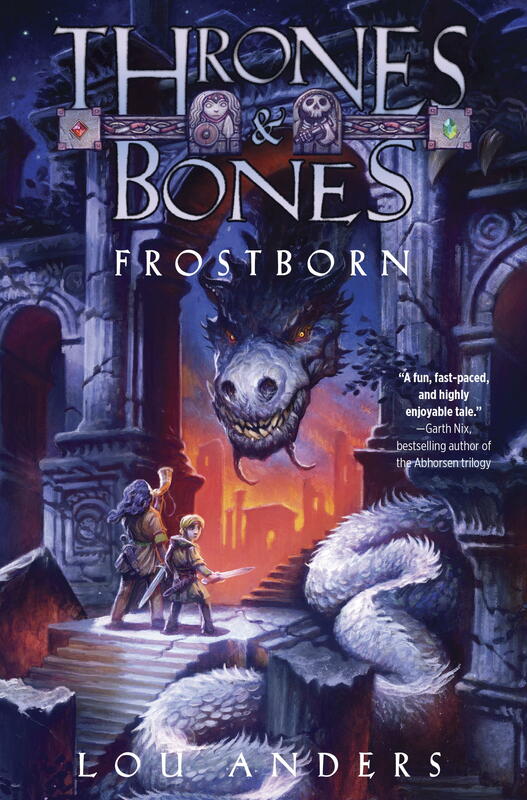 Also, while I’m talking about voice-inspiration, let me take a moment to say how fabulous Fabio Tassone’s narration is in the Frostborn audiobook. I couldn’t be happier with his performance and can’t wait until others hear it too. 4. You’re a gamer, so I can see where Karn’s interest in board games comes from. How about Thianna’s skiing and wrestling? Which of her attributes come from your interests? I grew up skiing in Colorado and Montana every spring break, and while I haven’t been on the slopes in years, it was definitely a formative experience. And while I’m not recommending this, I used to love finding trails through the woods where multiple skies had carved out deep tracks through the snow and racing down this like it was a bobsled tunnel. I also white water rafted in Tennessee (including at least one occasion in pretty dangerous conditions), so you see some of that in Frostborn too. I never wrestled seriously, but I was involved in martial arts for years. And, like many of us, I did grow up feeling out of step with my immediate environment. Oh, and I can cast ice magic. 5. I sense a Roman influence on one of the cultures we don’t visit in Frostborn. What other parts of the world can we expect to see in the second and third volumes? Roman, yes, but not entirely. The Gordion Empire, which fell almost a thousand years prior to the events of the novel, was actually based initially on a Phrygian culture, which then absorbed a Roman culture. So while they built coliseums and fought with gladius and spata, their religion and their fashion sense is more Phrygian. You get traces of that in the statuary they left behind. But you don’t need to know that yet! The answer is that books two and three will see us hopping all over the continent of Katernia, and visiting several new cultures as we do. We’ll be getting a much bigger glimpse of the wider world, as seen through the perspective of two kids from the very tip of it. Visit Lou Anders online at his website or on Facebook, Tumbler, or Twitter. Probably should have read this post BEFORE I walked into a used bookstore today, because I am utterly fascinated about this world simply from this interview. Now to figure out how to stop time so I can read everything I want to read before my vacation ends in a few days.